Do you wish you never had to leave that chalet you rented on your last ski vacation? If you enjoy the simple, relaxed feel of the chalet style of interior decorating, why not try to re-create this theme in your own home? After all, you have to live in your home all the time, so you might as well enjoy it. Bring your holiday home so to speak and revel in that chalet "feeling" all year round. Chalet style decorating begins with a soothing color scheme. Creams, whites, or pale blues are popular choices for painting walls and provide the foundation and "tone" for the rest of the decorating ideas. Avoid using reds, oranges, or bold blues and greens on the walls wherever possible. These are simply too strong and take away from the atmosphere of relaxation that the other colors can create. You're looking for a color scheme that will promote relaxation and warmth whereas the other colors can either stimulate you or make the room feel rather "cold" - this is the last thing you want. Next on the list you'll want to consider furnishings and furniture in general for the room. 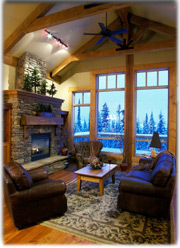 Comfort is importan t when you are decorating with a chalet style. Overstuffed chairs, ottomans, and cozy love seats all fit well with this theme. Colors used in the furnishing can be brighter than the walls, but you should still reconsider buying that lipstick red couch as the color is simply too vibrant for this particular theme. Wooden pieces are often those with a mellow pine finish. Whitewashed pieces also fit in well with this theme and really do scream "rustic". Don't add too many accessories to a room decorated in the chalet style. This style is simple and you will definitely want to go with the "less is more" concept of home decorating. A few plush pillows and a cozy blanket are important for a bedroom, living room, or family room decorated in this theme. A few family photos in simple frames and a ski related accessory will finish off the room. Once the room is completed, don't forget to take time to sit and enjoy your chalet style room. After all, no matter how you decorate a room, it can't help you relax unless you actually use it. We hope you enjoy it!